Ah Hawaii, a place of golden sandy beaches, warm tropical waters, luxuriant foliage and snow-capped peaks. Wait a minute! Snow? In Hawaii? It’s true. 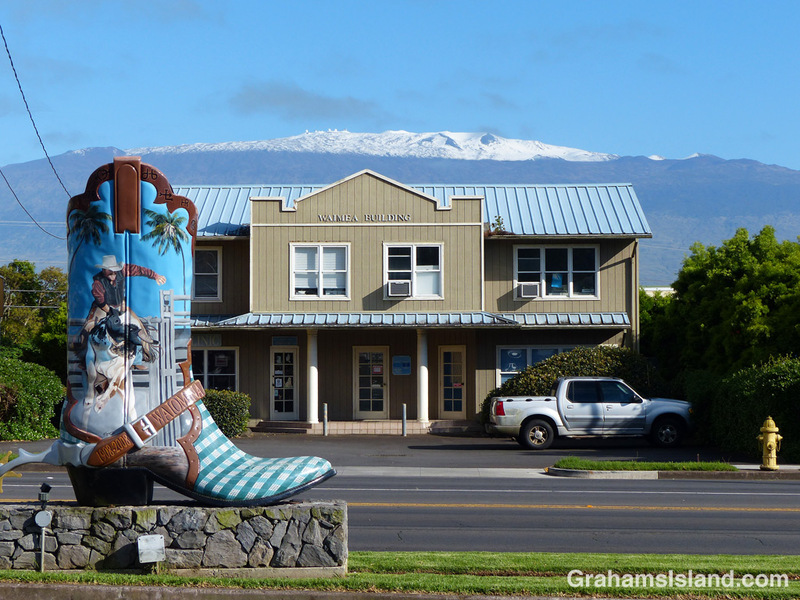 Here on the Big Island, Mauna Loa and Mauna Kea are high enough to see snowfall most years. People go up there to ski and tube. There’s a local tradition of driving up the mountain, loading a pickup truck with snow, and then driving back to lower elevations for a snowball fight. This winter’s first snow fell yesterday. Last year, there was a snowfall in July! This photo is from last winter, taken from Waimea, which as the foreground suggests, is paniolo (cowboy) country. This is one image where I photoshopped something out, in this case a distracting wire trailing above the building’s roofline.